The Dustite LR® combines a loose wheel nut Indicator, with a standard dust cap for use on wheels with trims. 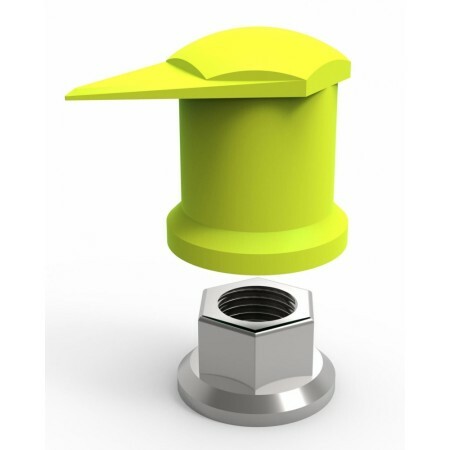 Like the Checkpoint®, Dustites LR® indicate loosening of safety critical nuts and includes a wheel overheating function, but offers the additional benefits that come with a wheel nut cap for protecting the nut from weathering, corrosion and general road damage. Prolong the service life of studs & nuts, through protection from corrosion, weathering and damage. Dustites LR® is designed to be fitted on wheels with trims/step ringssince the pointer, located at the tip of the product, allows for it to fit through the access hole on a trim/step ring. Where a trim/step ring is not fitted to the wheel, Dustite® or Checkpoint® indicators must be used. Dustite LR® is fitted onto the wheel nuts in a recognisable pattern once the nuts have been tightened to the manufacturers recommendations using a suitable torque wrench. This must be monitored closely through routine walk around checks, so that if any of the indicators move from the initial pattern appropriate action can be taken.